Dubai: Electronic devices bought at Dubai Duty Free could cost a passenger their flight due to new security regulations at Dubai International, Dubai Duty Free confirmed on Monday. On July 8, Dubai International introduced new security checks as part of a US Department of Homeland Security warning to foreign airports serving direct flights to the United States. Passengers travelling to the United States, Canada and the United Kingdom may be asked to turn on their electronic devices to prove they are real. Those unable to turn on their devices risk being denied boarding. Michael Schmidt, manager-retail sales at Dubai Duty Free (DDF) confirmed to Gulf News that purchased Duty Free electronic products are subject to the same security checks. 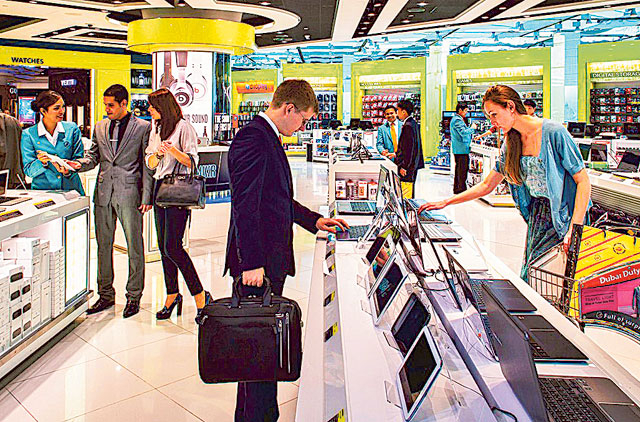 “All electronic devices available at Dubai Duty Free are sold with chargers and as long as the passengers can demonstrate that their devices can be charged on request, then it should not be a problem,” he said. Passengers are unlikely to have to charge their DDF mobile purchases at the airport as most mobile phones have an average battery charge of 20 to 30 per cent when bought in store, Ashish Panjabi, Jacky’s chief operating officer told Gulf News. However, the battery charge decreases the longer it sits on the shelf. Passengers buying gifts from DDF may have to risk opening the packaging if they wish to board their flight. “For passengers purchasing an electronic device as a gift, they must cooperate with the security and open the item if asked,” Schmidt said. The new security checks have not impacted sales of electronic devices and staff are briefing customers on the recent changes. “Dubai Duty Free customers have not faced any issues in relation to the new security regulations,” Schmidt said. Dubai International is the busiest airport for international passenger traffic, according to latest data, with it overtaking London Heathrow in the first quarter. Emirates, along with other carriers, operate daily direct flights to the US, Canada, and UK. “All electronic devices are required to have sufficient power before reaching the airport. This advisory is part of enhanced security measures required by the authorities of these countries and is applicable to passengers of all airlines,” an Emirates spokesperson said on Sunday. Signs inside Emirates’ Terminal 3 advises passengers to ensure electronic devices are charged and can be switched on before boarding. The new security checks impact passengers starting their journey from Dubai as well as those transiting. Abu Dhabi International, which hosts the only US-Pre Clearance facility in the Middle East, has not introduced any security changes in response to the US Department of Homeland Security warning.